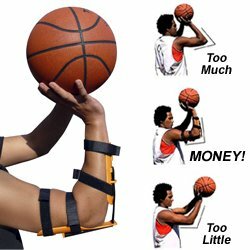 The basketball shooting accuracy trainer Bandit Shooting Machine puts your arm in the proper firing position every time. Missing shots is often due to poor elbow mechanics. The Bandit helps you to improve your elbow mechanics and perfect your elbow position. The Bandit can be worn on either arm to develop right-handed or left-handed shots. The Bandit shooting machine builds muscle memory as it trains your arm to shoot with just the right amount of movement. Complete with video & training manual with shooting drills and instructions.